The festive booties you need this season and three ways to style them for any occasion. With the holidays just around the corner, I love incorporating festive pieces into my wardrobe. 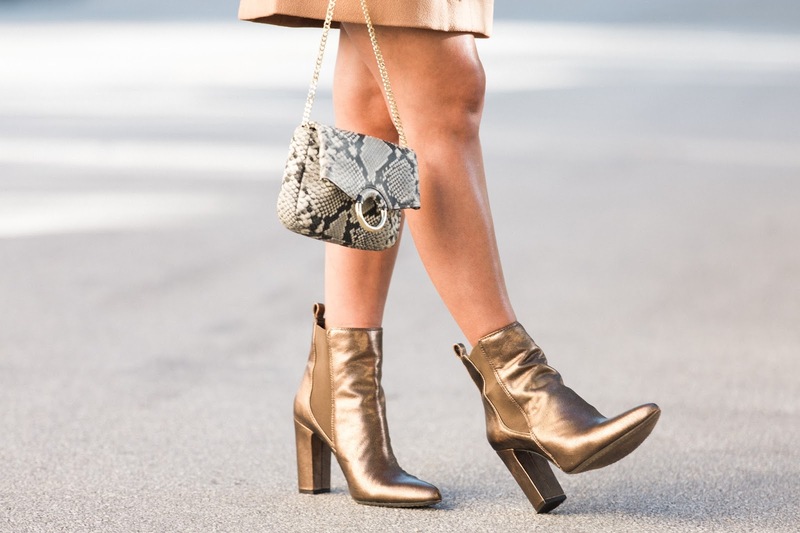 I partnered with Vince Camuto to style their Britsy block-heel bootie, and hope they inspire you to take a walk on the metallic side. You may be asking yourself, “who really needs gold boots?” To which I say: EVERYONE. A metallic is just as neutral as a leopard print IMO, and these fun booties are the perfect accent to make any look pop. (In fact, my Insta-fam chose these over the same style in leopard!) From mini skirts, to blazers, jeans, and feminine dresses–the styling options are endless with these versatile boots. Gold just not your thing? They come in four other colors, and the white ones are next on my list. P.S. Black Friday came early! Use code EARLY40 to score these babies at 40% off! True story: I wore these booties for the very first time last week in Madrid. After spending the whole day walking the city and sightseeing…5 miles later!… I can say, without a doubt, they’re the most comfortable boots I own.